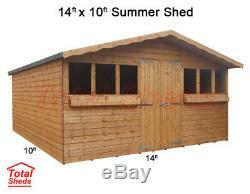 14FT X 10FT SUMMER SHED. Postc odes Include: B, DY, WS, WV. Postcodes Include: CV, CW, DE, GL, HR, LE, MK, NG, NN, OX, ST, SY, TF, WR. Postcodes Include: AL, BA, BB, BD, BL, BR, BS, CB, CF, CH, CM, CO, CR, DA, DN, E, EN, FY, GU, HA, HD, HG, HP, HX, IG, KT, L, LD, LN, LS, LU, M, N, NP, NW, OL, PE, PR, RG, RH, RM, S, SE, SG, SK, SM, SN, SP, SS, SW, TW, UB, W, WA, WC, WD, WF, WN. Postcodes Include: BH, BN, CA, CT, DH, DL, DT, EX, HU, IP, LA, LL, ME, NE, NR, PL, PO, SA, SO, SR, TA, TN, TQ, TR, TS, YO. THIS IS A MULTIPLE LISTING PLEASE SELECT FROM THE DROP DOWN MENU FOR AVAILABLE SIZES AND PRICES. 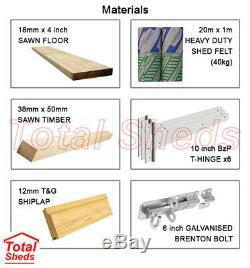 WE ONLY USE THE BEST QUALITY TIMBER TOGETHER WITH THE FINEST WORKMANSHIP AND THE MOST STRINGENT MANUFACTURING PROCES S.
PLEASE SEE BELOW FOR OUR TIMBER SPECIFICATION. PLEASE NOTE ALL OF OUR TIMBER IS IN FINISHED SIZES (NOT EX-MACHINED). 12mm SWEDISH RED-WOOD TONGUE & GROOVE SHIPLAP. 38mm x 50mm FRAMEWORK THROUGHOUT BUILDING INCLUDING ROOF & FLOOR. 18mm FLOOR BOARD PLANKS WITH FLOOR BEARERS ATTACHED TO KEEP BUILDING ELEVATED OFF THE GROUND. 12mm SWEDISH RED-WOOD TONGUE & GROOVE SHIPLAP FOR THE ROOF. 40KG HEAVY DUTY BITUMEN PLUS MINERAL FELT WHICH IS INDIVIDUALLY FELT NAIL TACKED ON (NOT STAPLED). ALL BUILDING SECTIONS ARE FULLY FRAMED AND ALL OUR FRAMES ARE SCREWED TOGETHER WHEN MANUFACTURED AND ERECTED. WE ONLY USE GALVANISED NAILS IN OUR BUILDINGS AND ALL CLADDING IS DOUBLE NAILED FOR EXTRA STRENGTH. ALL SUMMER SHEDS COME WITH 3x GALVANISED HINGES PER DOOR, GALVANISED BRENTON PADBOLT AND 2x TOWER BOLTS ON SECONDARY DOOR AS STANDARD. WE DO NOT USE OSB BOARDS, CHIPBOARD, OR ANY OTHER INFERIOR SHEET OR BOARD MATERIAL IN OUR ROOFS OR FLOORS. ALL OUR SHEDS ARE MADE USING TOP QUALITY TIMBER AND ARE MANUFACTURED AND FITTED BY OUR SKILLED AND EXPERIENCED CRAFTSMEN. WE MAKE OUR OWN SHEDS SUMMER HOUSES AND THE SAME GUYS WHO MAKE THEM ARE THE SAME GUYS WHO DELIVER AND ERECT THEM. ALL THE PICTURES WE ADVERTISE ARE OF OUR OWN BUILDINGS WHICH WE HAVE DELIVERED AND FITTED FOR OUR MANY HAPPY CUSTOMERS. PLEASE READ OUR FEEDBACK AS CUSTOMERS HAVE TOLD US THAT ITS. THIS SUMMER SHED COMES WITH WINDOWS EITHER SIDE OF THE DOOR, AND WITH TWO LARGE WINDOW/PLANTER BOXES UNDERNEATH THE WINDOWS, WE USUALLY MANUFACTURE THESE WITH DOUBLE DOORS BUT YOU CAN HAVE SINGLE IN YOU PREFER JUST LET US KNOW WHICH YOU WANT. 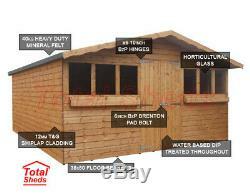 THIS SHED IS SUPPLIED WITH HEAVY DUTY 40KG BITUMEN PLUS GREEN MINERAL FELT THE BEST SHED FELT AVAILABLE. THERE IS A 1FT EXTRA OVERHANG TO THE FRONT OF THE APEX, WHICH IS TONGUE AND GROOVE UNDERNEATH TO GIVE A CLEAN PROFESSIONAL FINISH, PLEASE TAKE A LOOK AT THE PICTURES. 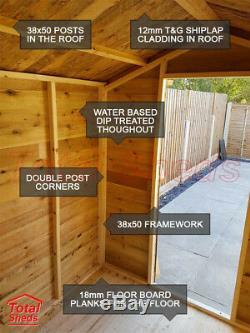 WE CAN MAKE THIS BUILDING WITH SINGLE OR DOUBLE DOORS FOR THE SAME PRICE JUST TELL US WHICH YOU PREFER. THE DOORS COME WITH TWO TOWER BOLTS FITTED AT THE TOP AND BOTTOM OF SECONDARY DOOR AND A GALVANISED BRETON PAD BOLT LOCK ON THE OUTSIDE. ALL YOU NEED IS YOUR OWN PADLOCK!!!! WE DO REQUIRE GOOD ACCESS TO GARDEN AREA WHICH IS NOT HEIGHT RESTRICTED AS PANELS AND SECTIONS ARE QUITE LARGE AND HEAVY. 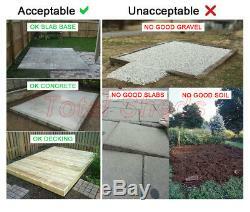 WE ALSO HIGHLY RECOMMEND A GOOD LEVEL BASE FOR THE BUILDING TO BE CONSTRUCTED ON. THIS WILL ENSURE THE LONGEVITY OF THE BUILDING. HOWEVER AS WITH ALL TIMBER PRODUCTS WE ALWAYS RECOMMEND THE CUSTOMER RETREATS ANY BUILDING WITH AN OIL OR SPIRIT BASED TREATMENT TO PROLONG THE LIFE OF THE BUILDING AND TO MAINTAIN THE LOOK AND QUALITY OF THE TIMBER. WE LOOK FORWARD TO YOUR ORDERS. The item "14FT X 10FT GARDEN SHED SUMMER HOUSE WITH +1FT OVERHANG HIGH QUALITY WOOD TIMBER" is in sale since Sunday, July 16, 2017.